Tired of the same meeting in the same office boardroom? Wish you could just get away for the day and try something new for a change? We have a solution for you. Mix business with pleasure and have your corporate or business meeting in the morning and experience golf at its finest in the afternoon. Our meeting rooms are enhanced with contemporary decor and natural lighting. Need audio visual equipment? We have what you're looking for! 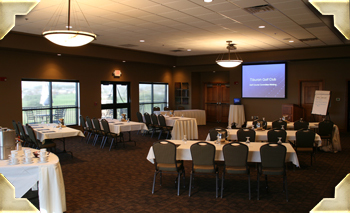 With drop down screens and projectors in each room and a wide selection of other tools, we make it easy to showcase your next presentation. 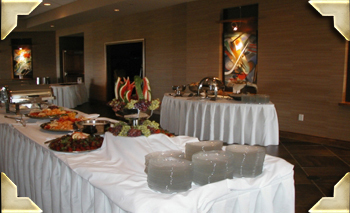 Then let the professional staff at Tiburon take care of your golfing and dining needs. Impress your clients with a short clinic provided by PGA Golf Professionals and enjoy up to 27 holes of championship golf at its finest. After the round, sit back and relax while our staff wines and dines your clients in our newly built clubhouse All you have to do is sit back and watch the sun set. You owe it to yourself to mix business with pleasure.